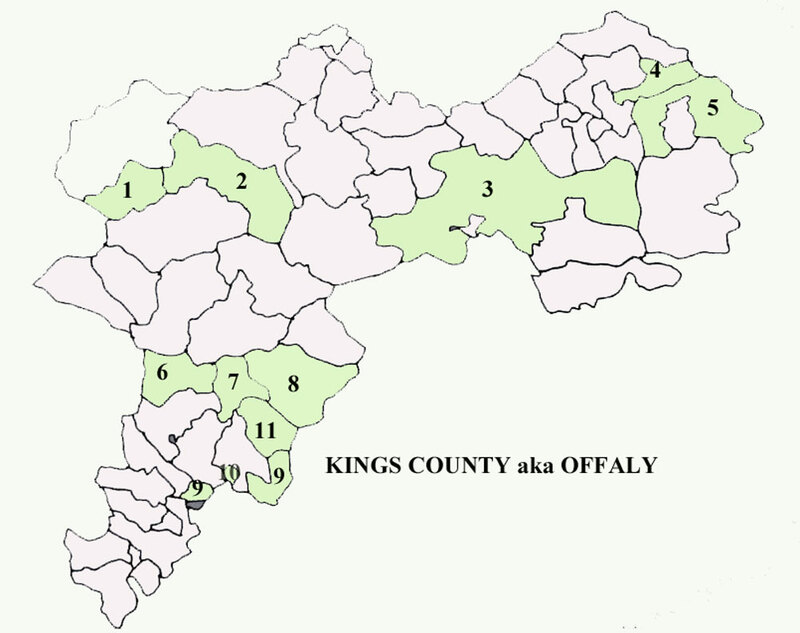 JACKSONs of Kings Co. aka Offaly. The main purpose of this page is to explore the links between various JACKSONs of Grange, Parish of Sierkieran, Kings Co. The clusterings of parishes where JACKSONs can be found is likely meaningful in terms of familial connections. See also: JACKSONs in Kings Co. Deeds. and JACKSONs in Family Trees. Parishes: 1 Tissaren; 2 Killygally or Wheery ; 3 Geashill; 4 Ballymacwillen; 5 Monasterosis; 6 Birr; 7&10 Seirkeiran; 8 Kinnitty; 9 Roscrea; 11 Roscomroe. 1710. It is possible that the Robert JACKSON of Roosk, in Ballymacwilliam was related to the JACKSONs in the family tree of JACKSONs of Co. Kildare Outline Tree-1 Their earliest known member is a Thomas JACKSON who died 1690. This Thomas JACKSON had no known sons named Robert JACKSON, but the JACKSONs of Co. Down does start with a Robert JACKSON, (probably b. 1619-1624) of Ecclestone, Lancashire, England who had a son named Robert JACKSON (?-aft 1717) about whom little is known. Just to add to the confusion, in some records Robert JACKSON, (probably b. 1619-1624) is recorded as John JACKSON rather than Robert JACKSON. This Robert (or John) was a supposed brother of two influential Irish-based Quakers: Anthony JACKSON (1628-1681/96) and Richard JACKSON (1626-1679). The Robert JACKSON who died in 1711 of Crooked Staff is also one to not lose track of, simply because of the convergence of name and time frame. He had a son named Robert JACKSON (1621-aft 1725). 1712. The Rev John JACKSON (1688-1751) who owned lands in the neighbouring parishes of Tissarren and Killygally or Wheery was the husband of Anne CASTLETON (?-1729). His family came from Staffordshire, and by his generation his branch of the family was based in Dublin. See: JACKSONs of Staffordshire . 1737. Seirkeiran and Birr based branch of JACKSONs starts with another Robert JACKSON (bef 1716-aft 1737). SEE: JACKSONs of Kings Co. – Seirkieran. Most of what I have learned about this family has come from deeds and court cases with the CURTIS family. There may be familial links with some JACKSONs of Co. Wicklow (or Co. Carlow), but nothing conclusive. The JACKSONs of Grange, Parish Seirkeiran held the rights to tithes and/or had other interests in a number of parishes in Kings Co.: Roscomroe; Sierkieran; Kinnitty; Tissarren & Birr. This family connection was still evident as late as 1833. NOTE: A Robert JACKSON held land at Castletownmoor, Co. Meath at about the same time as this Robert JACKSON seems to reside at Grange. Since the Castletownmoor lands were likely inherited from Samuel JACKSON (1641-1705) of Kirkby Lonsdale (born in Halton) and Dublin, it is not far-fetched to suggest that the Robert JACKSON (bef 1716-aft1737) of Grange might have been a son of Rev. Robert JACKSON (1690-1733) of Tatham, but more research is needed. 1870s A 2nd line of JACKSONs (or at least what looks like a 2nd line) had holdings in the parish of Roscrea. They are documented in the Ballyboy JACKSON family tree. The parish of Roscrea straddles the border of Kings Co. & Tipperary, and is on the southern border of Roscomroe, part of a cluster of parishes where JACKSONs lived for quite some time. See: JACKSONs of Co. Kildare Detailed Tree-1. It is curious that this family which is based in Co. Kildare has a family tale about building a stone house in Monasterosis sometime before 1690. This parish straddles the border between Kings Co. and Co. Wicklow. 9 June 1737 by said Christopher LOVETT to Robert JACKSON senior. See 1760 deed where this is referenced. Minchin JACKSON. NOTE: I could not find a place called Fortnall in Kings Co., but there is a place called Fortel in the Parish of Birr. At the time of Griffiths, a James JACKSON leased 75 acres at Fortel from a Richard HACKETT. Mentions lease of part of Ballinderry (Ballinderra, Kings Co,) held from James JACKSON. Robert JACKSON of Grange in Kings Co. Gent. Tythes of St. Kerans Parish; Tythes of Knockarley Newtown & Lowhollon in Rosconnor Parish [aka Roscomroe]; lands of the Glebe lands of Upper Ballyshane; Tythes of Upper Ballyshane Tulla Ballyhalack Ballym’Murragh Glenfilly 100 acres Kinnitty & Castletown in Kinnitty Parish in Ballybritt Barony in Kings County. James JACKSON, Birr, Kings Co., Gent was a witness to the will of Robert WELDON, wife, Mary WELDON, daughter Mary WELDON. Birr is in the Barony of Ballybritt. JACKSON Rob’t Conveyance The elder, Esq. Grange, Kings Co. Randall COOKE, Esq. From Tipperary released to Robert JACKSON the elder of Grange, Kings Co. the lands of Ballymacmurragh, Kings. Co.
Robert JACKSON the elder; Robert JACKSON the younger.There are also JACKSONs of Cloncon House, Tullymore, Derryclure, Parish Geashill SEE: Ballyboy JACKSON family tree.). I do not know if this is it. Ballymoney is described in a later deed to be in the Barony of Ballybritt. Robert JACKSON the elder of Grange in Kings Co. Esq. to his son & heir apparent Robert JACKSON Esq. the younger of the same Grange. Robert JACKSON the elder of Grange in Kings Co. Esq. to his son & heir apparent Robert JACKSON Esq. the younger of the same Grange. NOTE: This is based on a hunch that Ballymoney is now known as Lismoney. Lands of Ballindarra held under James JACKSON. NAMES: Hanibal FRASER; Ann FRASER née JACKSON, brother James JACKSON; Eugenia JACKSON of Grange and Birr, widow of Robert JACKSON; Mathew HERBERT; Robert DROUGHT of Dublin; Thomas LACY; William MOORE. OTHER PLACES: Liscloony; Clanbamiss; Parsonstown, all of Kings Co.
Memorial registered 9 June 1801 of lease of 4 May 1801 for lives renewable for ever by Robert JACKSON of Grange in Kings Co. Esq. to Henry HARDING of Dublin City Gent. Memorial registered 10 May 1802 of Deed of Assignment of … June 1798 from Eugenia JACKSON widow & sole executrix of will dated 22 March 1781 of Robert JACKSON of Grange in Kings Co., Esq. deceased to Henry JACKSON 2nd son of Robert & Eugenia. Tythes of St. Keran Parish. Tythes of Knockarley, Newtown & Lowhollen in Roscennor Parish lands of the Glebe of Upper Ballyshane. Memorial registered 12 March 1805 of mortgage of 1 January 1805 for £352 13s by Henry JACKSON of Grange Cottage in Kings Co., Esq. to Valentine O’CONNOR junior of Dublin City Esq. merchant – same list of tythes as in #321021 (also in 1805). Memorial registered 11 January 1805 of mortgage 10 January 1805 for £600 by Henry JACKSON of Birr in Kings Co. Esq. to Joseph CURTIS of Bath Esq. Tythes of St. Kerans Parish & of Knockarly Newtown & Lowhollon in Rosconroe Parish, Glebelands of Upper Ballyshane; Tythes of Upper Ballyshane Tulla Ballynack Ballym’Murragh Glanfilly 100 acres Kilnity [Kinnitty] & Castletown in Kilnitty parish in Ballycrit Barony in Kings Co.. WITNESSES Benjamin KERNEY & Samuel BARRY both of Dublin City Gents. Memorial signed by Henry JACKSON. Of possible interest is the 1833 Tithes of Sierkieran. Both the representatives of Robert JACKSON deceased & Francis JACKSON Esq. are recorded in relation to close to 3,500 acres in the parish of Sierkieran [aka Kierans].